Emergency services and an ambulatory unit will be all that remains at Long Island College Hospital as Judge Johnny Lee Baynes gave the green light to a deal between SUNY and Peebles Corporation for a mixed used complex there. Emergency services will continue there until May 27 under the auspices of North Shore-LIJ who have partnered with the developer. The current LICH staff will dismissed at midnight tonight (5/22). 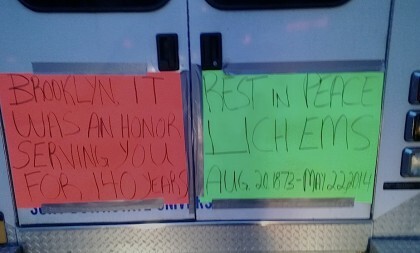 A BHB reader sent us a photo of two farewell signs on the back of a LICH EMS vehicle parked outside the hospital. Brooklyn Eagle: If the deal is concluded with the State University of New York, developer Peebles Corp. would maintain a walk-in ER at the site, and resume ambulance service by July 15. Peebles plans a mixed use development of the LICH campus. The last shift of hospital staff was released from duty earlier than expected & as they were leaving the premises, a baby was being born on a stretcher in the urgent care emergency department that is now where the full service ER used to be. Without a hospital on site, mother & baby had to be put into an ambulance shortly after the birth & transferred to a real ER in a real hospital. The emergency department staff had not yet been laid-off & there were still a handful of nurses in that area when the patient came in but there were no longer any obstetrical or neonatal (baby) nurses or ob/neonatal doctors on premises. Thank g-d there were no complications with the delivery. News headlines saying that “LICH” remains open are a lie. LICH is no more. Just like Christ Quinn did with the old St Vincent’s, Mayor deBlasio has an urgent care room & still-to-come free standing emergency department at the site of the former LICH. Everyone knows that no matter what the needs assessment shows, it’s doubtful that a full hospital will ever be opened there because to start another one up from scratch is difficult, expensive & probably “not feasible”. Especially not feasible once the hospital space is under construction for luxury condos. The fight for LICH was about protecting the community. If the community feels they literally can live with the little they have been given now, we can only wish them well. Thank you, but the fight for LICH was ABSOLUTELY NOT about “protecting the community.” Please. Really? What are you implying, please? I have been living in the community for over 35 years. I ABSOLUTELY believe we would be best served with a real hospital in our community! Note: There are others who were too weak and corruptible — just one for instance, the New York Times. Whatever happened to free press and reporting the truth?